Ever been intrigued by the Indian Fashion Industry—its stereotypes of drugged models, gay designers, and fascinating but unaffordable clothes? Join Shefalee Vasudev, former editor of Marie Claire and an acclaimed fashion journalist, on a deep‑sea dive into the gagging depths of Indian fashion. In Powder Room, she offers an insider’s view of people who make the industry what it is—from a lower middle class girl who sells global luxury for a living to a designer who fights the inner demons of child sexual abuse yet manages to survive and thrive in the business of fashion, or a Ludhiana housewife on a perpetual fashion high. I don't think I have ever been a keen follower of fashion and could barely tell a Sabyasachi ensemble from a Masaba masterpiece. But that was before I decided to indirectly get involved in the world of fashion .I now faithfully thumb through the fashion glossies to make sure that I keep myself abreast of the latest fads and 'Fashion'. Well, if there is one word that is abused and bastardized , it has to this F word, Fashion , which changes at a mercurial pace like the moods of a sullen,moody teenager. Moody or not, my fascination was piqued and I decided to read this book. A fellow blogger had also recommended this book and rated it highly. I found Powder room brilliant, insightful and full of amusing anecdotes Ex-editor of Marie Claire , Shefalee Vasudev has written this book like a sociologist would have, with considerable journalistic detachment. Having observed various facets of 'fashion' from close quarters , her observations and arguments don't seem sensational or voyeuristic.The book is divided into ten chapters , where Shefalee tackles a different story or talks about a certain aspect of the world of fashion. Apparently , she spoke to close to 300 odd people before writing this book. The academic rigor and research she has put into this book is evident in the mind-boggling amount of data and information that hits the reader. Right from the first chapter, where Shefalee talks about Raakesh Agarvwal , a troubled , yet hugely successful designer who was abused as a child and still has demons inside him that haunt him , to the socialite wives of Ludhiana to the lower middle class girl selling luxurry products , to the politics behind the fashion weeks , Shefalee weaves a narrative that bounces back and forth like a ping-pong ball.Yet , at no point in time will the reader feel disoriented, because the stories she has to tell are all extraordinary. My favorite stories have to be the one about the lower middle class girl and that of the Ludhiana society ladies. If you are looking for scandals or gossip , this might not be the book for you(of course , that aspect is there too). 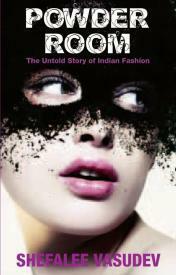 This book is more an exercise in sociology, an attempt to see where the fashion trajectory of India is headed. The chapter on models was an eye-opener. Madhur Bhandarkar probably has done a huge disservice to the model community by talking about the negative aspects of the modelling world. Shefalee's book will make you realise that such wayward models are exceptions and not the norm. Huge egos of designers, manipulative PR agents , unscrupulous editors, appalling lack of integrity in fashion journalism..Shefalee's book talks about them all. Maybe if you just want the juicy parts, you'll still love this book. The chapters on Patan Patola and the last chapter on the politics at the fashion weeks makes one realise the pettiness and business-mindedness of some factions on designer community and the clout that the big brands have over everyone. It is disheartening to note that going by the way things are being handled old traditional weaves like the Patan Patola will probably go extinct soon. Hats off to the family for trying to keep this art alive, but one does wonder if a more commercial approach is required by the artisan family to ensure that their craft doesn't go extinct with them. I was also moved by the chapter on Imchi Imchen and how Nagas feel alienated from the "Mainland".I am intrigued enough to want to read a book on Nagaland and how insurgency has affected the people there. Maybe there is an underlying tone of melancholy and desperation in the book. Certain parts of the book paints a rather bleak picture of how things are in the fashion industry , but somebody has to talk about these things. Thanks to Mysmartprice.com for sponsoring my book. Definitely seems to be a compelling read, but I don't know whether it can be considered as a well-researched book, because anecdotal evidence tends to highlight only the writer's POV. Huge egos of designers, manipulative PR agents , unscrupulous editors, appalling lack of integrity in fashion journalism. Tell me any high profile and creative profession (cinema, music, art, writing, advertising) which doesn't have this. PS: Why don't you attempt a novel on the travails of the writer in the publishing world? Otee.. Sometimes when we like something passionately , biases do creep in ;-0.. the other 2/3rds didn't disappointing me enough to bring the rating down.. which has happened with a few books..this is an incredible book, really. oh, the anecdotal bits are there , but there are also a lot of facts about the industry ..It is entirely my mistake that the facts part of it was not highlighted. Actually , every profession is like that ..not just the creative arts.Having spent time in consumer durables and banking , I know that every single profession is rife with pettiness and egoistic fools :) Don't let my biased review keep you from this book .. It is pretty grounded and non-sensational..